One of the largest year round winter wonderland in the area is at West St Paul Antiques, with is Minnesota's largest Antique Mall. This year round holiday area with in our store is over 1,000 sqft of displays and product. We would like to welcome you to our website. Our mall becomes one big holiday wonderland from Novenber 1st - December 31st of each year with over 25,ooo sqft to this mall stop by this year. Where children and adults alike get whisked away into the holiday spirit, viewing awe inspiring displays of villages, collectibles, wonderfully decorated trees, and trains that will blow the mind. To browse our entire color photo gallery on Dept. 56! A Brief History Of Department 56, makers of lighted Christmas houses and accessories, snowbabies and Possbile Dreams. Some twenty-five years ago, Department 56 began as part of Bachman's, a premiere retail florist in Minneapolis. Bachman's used a numbering system to identify each of its departments. The number assigned to wholesale gift imports division was, you guessed it, 56. Now headquartered in Eden Prairie, Minnesota, Department 56 has become a leader in the giftware, collectibles and holiday decorating industry and is best known for our hand-crafted lighted villages, Snowbabies� figurines and extensive lines of holiday and home decorative products. The foundation of Department 56 took shape with the introduction of six charming, lighted, ceramic buildings. These six premiere items were the beginnings of The Original Snow Village. The concept of The Heritage Village Collection was developed. The first release was The Dicken's Village Series�, a collection of seven nostalgic shops and a church. All designed to capture the spirit of Christmas in Victorian England. The New England Village Series and The Alpine Village Series� were added to The Heritage Village Collection. That same year, the world of Snowbabies bisque figurines was introduced. The Heritage Village collection continued to grow with the addition of the hustle and bustle of Christmas in the City and the inspiring Little Town of Bethlehem. The legend of Santa became a part of the Department 56 tradition with the addition of The North Pole Series� to The Heritage Village Collection. In June of this year, Department 56 completed an initial offering and was listed on the New York Stock Exchange under the symbol "DFS". This year brought the introduction of The Disney Parks Village Series and Snowbunnies. Our first successful marketing program, "Homes for the Holidays", encouraged new collectors to start a tradition for themselves. The 10th anniversary of Snowbabies was celebrated with the creation of the Snowbabies Friendship Club�. 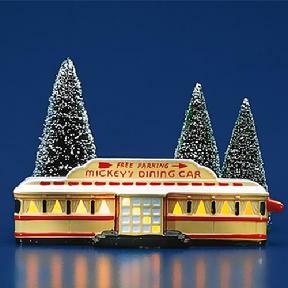 The Classic Ornament Series was also introduced, giving collectors a new way to enjoy classic pieces long since retired. The first year-round village, Seasons Bay�, makes a splash onto the marketplace, representing a late 19th-century American resort town. Elf Land�, an extension of the North Pole Series�, was also introduced as a suburb where the elves lived and played after the holidays. Another big year for expansion. In October, we opened a second retail store in the new Aladdin Hotel in Las Vegas, Nevada. Our first magazine insert, Tablescapes, also hit the newsstands. 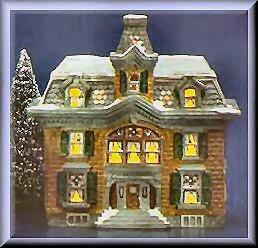 It featured new and imaginative ways to use Village pieces, Snowbabies and general giftware as a part of home d�cor. This year, Department 56 and The Original Snow Village Collection both turned 25. To commemorate those twenty-five wonderful years, we invited all our friends and collectors from across the United States and Canada to a spectacular Silver Anniversary Celebration in St. Paul, Minnesota. Many special edition pieces and limited items were designed just for this momentous occasion. A grand time was had by all. The next generation in lighting has arrived! Department 56 introduced eight lighted buildings that feature the new battery operated "long life cordless lighting" which eliminates the need for electrical cords in the lighted buildings. Now you can put up displays in places you never thought you could -- on a mantel, in a wreath or in the center of a table. Ralphie and the legend of the much coveted �Red Rider BB Gun� was at the center of a new mid-tier Village series, �A Christmas Story�. Department 56 created �Higbee�s Department Store�, �Ralphie�s House� and the famous �Leg Lamp� for the series which was sold exclusively through Sears Department stores. Appealing to the young and young at heart, �Tickle�, a line of luxurious collection of fashion and home accessories was introduced. This artistic inspired collection was the combined effort of many licensed and house designers. The offerings were as varied as the appeal. 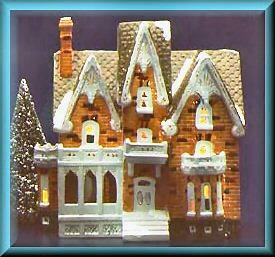 The Original Snow Village celebrated 30 years as the �gold standard� of lighted Villages and continues to attract new collectors, many are young families hoping to establish their own holiday traditions. New York City may be the largest city in the United States but �Christmas In The City� is still our favorite. This metropolitan inspired collection of lighted buildings, porcelain accessories and animated pieces celebrated its 20th anniversary in 2007. Department 56 is a major force in the giftware and collectible industry. As we look to the future, we plan to actively explore new avenues for growth. Rest assured, our artists are constantly busy coming up with new and unique ways to pique your interest and also touch the collector's heart in everyone. stop in to the Mall or stop by our web site soon.